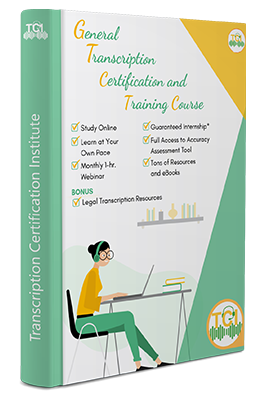 Access to the online course and all the training materials needed to start a successful career in transcription. An assortment of quizzes and sample audio files to test your skills. Access to resources, such as free transcription software, insider tips and tricks, and much more. A digital certificate of completion that you can print or link to your resume. With a qualifying final grade, you will be eligible for an internship with a reputable transcription company to gain valuable, real experience with real projects. Access to the TCI job board where you can post your resume for employers to see and also view job openings in the transcription industry. We Have New Lessons and Features in the TCI General Transcription Course! Enter your name and email address below to download the TCI course brochure for detailed information. New lessons & features added to the TCI Course.